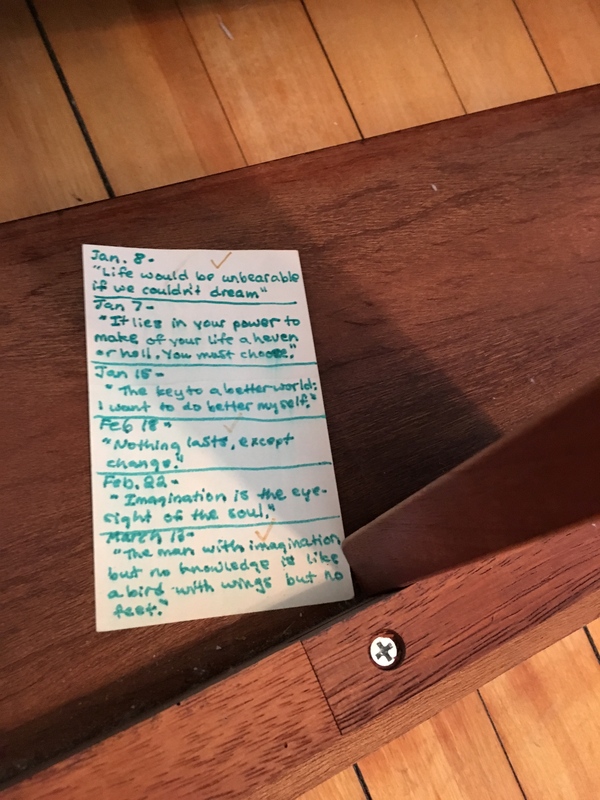 There it was—a collection of quotes stuck in my bed frame, written in the early 1970s when I was preteen. I found them last spring while I was moving. While it’s not particularly connected to what I’ve been thinking about lately, which is where I last left off, at the beginning of 1989: the year that probably changed the course of my life, there might some use for the old saw. That transformation actually began the year before, even though my journal at the time devotes a mere eight handwritten pages to 1988. But what’s even more interesting about the entry is the next paragraph. I touched on my relationship with Sally, a coworker at Fingerhut, adding intrigue to what I originally wanted to write about here: dealing with other people, protecting myself, yet still enjoying being in the world. That admission leaps out at me, revealing maybe less about how I felt about Sally and more about relationships in general. You see, for much of my early life, it was a touchy negotiation with the outside world. I often felt overwhelmed by the needs of others. As mentioned, my father was probably the biggest dog in the room. I’d get frustrated when my personal world was upended by his demands. From there it projected out into other spheres: school, friends and girlfriends, then later, bosses and coworkers. While there’s no journal entry marking the date, one such stargazing moment happened in 1988. I’d been killing time at the Ridgedale public library when, mindlessly skimming through the racks, I pulled down a copy of Roger Manvell’s biography of the English actress Ellen Terry. On the cover was Julia Margaret Cameron’s portrait of Terry at 16 years old, taken in Alfred, Lord Tennyson’s bathroom, of all places. Immediately I fixed on the photo—it was one of the most beautiful things I’d ever seen! It deserved an exclamation mark! I recalled it from years before when I was thumbing through art magazines as an art department aide at Lakewood Community College. I had to know the story behind the photo. So I checked out the book, devouring it in days. So, on Feb. 27, 1989, I wrote in the journal: “I’ve started a draft of a screenplay of Ellen Terry’s early life in the mid-Victorian theater entitled ‘The Wandering Moon’ and I’ve set a completed draft deadline for October. In November, for about two weeks around my 30th birthday, I’m planning on visiting London again…” I’d arranged to stay with old friends Lindsay and Abi (who then owned homes in Forest Gate and Wood Green, respectively), visit museums, art galleries, and locations in the script, and do research toward a rewrite. Which, ironically, leads us back to the opening quote: Imagination (seeing the story in my head) was the bird with wings. It could fly, but how would it land if it had no legs? That “obnoxious little black voice”—the thin borderline between self and others—would have to be strictly policed. I was hyper-aware of how the world would add distractions and rob my concentration. The frontier of the imagination is always there—I know that—but it took years of figuring out how invite others into it without jeopardizing the work I wanted to finish, someday. ~ by completelyinthedark on July 6, 2017.